IMG_2165, originally uploaded by All Things Mimi. I decided instead of making a cake for my sister’s birthday, I’d make brownies. Unfortunately, I was also making the rest of the dinner, so from scratch brownies weren’t really possible (well they could have been- but it’s freakin’ hot in that kitchen!). Just as I was wondering how to make a brownie mix more appealing, my Mom hands me a recipe for “Brownie Supreme.” Basically, this is a glorified brownie mix. Perfect! And it was pretty easy, although by the time I got finished doing the extra steps I probably could have made brownies from scratch….Oh well! 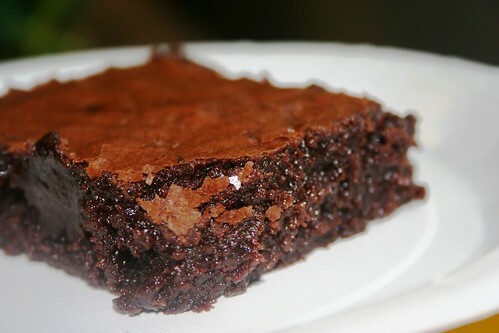 Dump contents of brownie mix in a medium bowl and add ¾ c. of sifted all purpose flour. Put all liquid ingredients called for by the recipe in another bowl. Add 2 eggs and 1 teaspoon of vanilla to the wet ingredients. In a double boiler, but one stick of butter and 2 squares (2 oz) of unsweetened chocolate. Melt it, then add 1 cup of sugar. Mix together. Pour the wet ingredients into the dry, then add the chocolate mixture. Stir everything together- but don’t over stir. Pour into a large pyrex dish and bake at 350 for about 40 minutes, or until set in the middle.